Held at knife-point by a band of thieves in South Africa, Robert Pothier calmly handed over his wallet and cell phone, thinking that the police would surely be able to identify and nab the suspects. After all, multiple surveillance cameras had recorded everything. 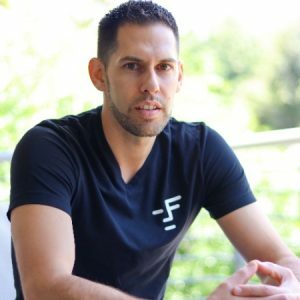 It was with this understanding after a frightful robbery in Johannesburg that Pothier began his mission towards bringing intelligence to video surveillance that would soon see him as Co-Founder and CEO of Faceter. Now, Faceter, a Blockchain startup, and the first vendor of computer-vision surveillance technology powered by a fog network of miners, has raised in excess of $10 million in their Token Presale, concluded in a matter of seconds on February 5. “Faceter is an advanced intelligent software for videostream analysis and facial recognition for business, government and consumers, developed to significantly reduce crime in society,” said Pothier. As the first facial recognition surveillance technology built on the blockchain, Faceter recently announced the details of its token sale. The token presale has raised in excess of $10 million in and concluded in a matter of seconds on February 5th. A crowdsale runs March 10 to April 30, 2018. Faceter started its Whitelisting procedure on January 29th, 2018. Huge demand and contributor’s activity necessitated that the team deliver additional tranches of tokens that were originally reserved for the Token Sale. Within 4 days Faceter recorded in excess of 8,000 Whitelist applications from 152 countries. As a result, Faceter has decided to run the Presale only on a Whitelist basis, with a queue and without free sale, in order to ensure fairness for the contributors. “We are happy that so many people globally are sharing our vision of the future. We believe that it will be fair to give the opportunity to more people globally to support our idea to make advanced AI-based technologies affordable to the mass consumers. We respect all the feedback received to date, and are working hard to meet the expectations of all contributors,” said Pothier. Participants in the Faceter token sale in return for their contributions receive FACE tokens. The distribution of FACE tokens will be subject to and governed by a separate document setting out the terms and conditions of the agreement as between Faceter and each token sale participant. Tokens will be issued on the Ethereum platform in accordance with the ERC20 standard. Faceter is the first decentralized surveillance system for consumers. It makes video surveillance smart, giving brains to cameras through enhanced face detection, object detection and real-time video analysis. These features allow cameras to understand the situation and respond to it, o ering much better security to all the customers. The company’s main component is a decentralized infrastructure where complex data processing using neural networks is performed using the decentralization powers of Fog Computing and Blockchain. With a Fog computing network, the cost of the product is significantly reduced by involving cryptocurrency miners into a decentralized computing network to perform recognition calculations with the added benefit of offering miners a higher income-earning opportunity. With this technology, Faceter uses all the nascent opportunities of smart contracts to deliver flexible and transparent payment options and as well as proof-of-recognition mechanisms to a Fog computing network. This is the way Faceter contributes to the growth of the crypto-industry. 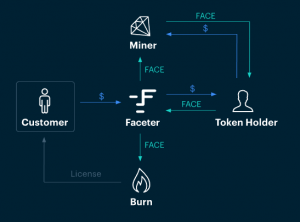 The FACE token is the “fuel” of a decentralized network enabling flexible, transparent, cross-border closed-loop settlement mechanism for all participants. It is the cryptocoin for payments Faceter gets from customers, and the work of participants in its decentralized network is paid by tokens as well. What is the difference between a crypto coin and a crypto token? ICO; it is a Token sale. The differences between crypto “coins” and crypto “tokens” can be confusing as they are both terms used to describe units of blockchain value. According to Fortune, “Tokens give the holder a right to participate in a given blockchain activity. For instance, a company might require people to have tokens to join an automated investment project or to get access to cloud computing services. Over the last five years, the surveillance market volume (hardware, software and services) has demonstrated an annual growth of 15.4% and, according to Markets & Markets, is projected to reach $75 billion by 2022. High crime growth rates, an increase in the number of terrorist attacks, and people’s concern over security are the main factors stimulating the development of the video surveillance market around the world. While out-dated CCTV security cameras can still serve to catch criminals in a limited capacity, they rely on humans to physically sit in front of screen to pour over hours of footage, and then hope that anyone in the public recognizes the perpetrators if the footage ever makes it to the local news. Now, Faceter is the first decentralized surveillance system for consumers. The smart surveillance company makes video surveillance smart, giving brains to cameras through enhanced face detection, object detection and real-time video analysis. These features allow cameras to understand the situation and respond to it, offering much better security to all the customers. With 99.78% accuracy in the Labeled Faces in the Wild (LFW) benchmark test, Faceter’s algorithm is one of the best in the world (top 6) using one of the most famous and well-respected tests among developers of facial recognition algorithms and solutions.